A company begins exploration of future operations in a remote and rural area of a poor, but resource-rich country. The communities in this area welcome the company's interest, seeing the prospects for improved social and economic conditions. They look forward to the creation of jobs and other income opportunities, and they look forward to being connected to the outside world through the company.The company, for its part, wants to get it right with local communities. In order to understand the context in which they plan to operate as well as to demonstrate their respect for local mores, managers hire an anthropologist or a non-governmental organization (NGO) to do community surveys. They see these as the first steps for establishing good relations between the company and local communities.Five years later, a visitor to the area sees schools and clinics that the company has built and staffed for the community. He sees upgraded roads and electricity that had not existed before. He sees increased activity in the region, more people and more vehicles, as people have migrated to the area for work. But he hears the company manager complain that he spends far too much time dealing with the community's "never-ending demands" and with "local trouble-makers," and he hears community members complain that "the company has done nothing for us. "This book has been written for corporate managers who are responsible for company operations in societies that are poor and politically unstable. Many such managers are frustrated with the situations they face. They try their best to run effective, profitable and beneficial operations that take account of the needs of all their stakeholders, including local surrounding communities. But, even with their best efforts, they encounter community dissatisfaction, unrest, opposition, and delays and, worse yet, threats and violence.In many ways, this book is also written *by* such managers because the information and learning it includes come directly from their day-to-day, grounded field experience. 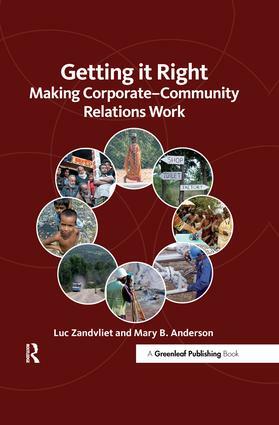 For seven years the authors have spent days and weeks at over 25 sites of companies – including (among others) BP, ChevronTexaco, Barrick, Shell, Total, and Newmont – operating in Africa, Asia, Latin America, Australia, and North America, talking with both company staff and local people. They have gathered evidence of how the daily, ongoing operations of companies interact with, affect, and are affected by the societies where they work. They have heard lots of complaints – on both sides. They have seen policies and programs, intended to establish positive relations, backfire and, instead, bring angry demonstrations at the company gate and seemingly endless negotiations and demands. They have also seen operations that are appreciated and supported by local people because of the positive impacts they have had.Both corporations and communities begin their interactions with positive attitudes and expectations, but in a short time tensions between the two rise and negative attitudes can supplant positive ones. In each location where CEP has seen this story play out, there are, of course, variations and details that reflect the specific context and local history. But the regularity and similarity of complaints across so many contexts also show that there are clear, and predictable, patterns in the processes by which company–community relations turn sour.Getting it Right reports, analyzes, and sorts the broad and varied experiences of these many corporations, bringing forward the lessons that can be usefully applied in other settings. The aim is to help corporate managers *get it right* with respect to interactions with local communities, so that they can more efficiently and effectively accomplish their production goals and, at the same time, ensure that local communities are better (rather than worse) off as a result of their presence. The book also addresses what has been learned about how companies can interact, appropriately and positively, with national governments and advocacy NGOs in ways that promote, rather than undermine, the welfare of the citizens of the countries where they operate.The book provides a treasure trove of practical experience against which other managers can analyze their own situations and, using what has been learned by smart colleagues before them, arrive at sound, practical approaches to their daily challenges.Getting it Right will be an indispensable resource for all managers working in community relations or responsible for operations in difficult locations, as well as for students of development studies, corporate social responsibility, sustainable development, the extractive industries, and stakeholder management. … the authors take a balanced, practical and jargon-free tone well suited to their corporate audience … The book is perhaps most valuable in terms of the overarching perspectives it attempts to impart to managers: that "community relations" activities are not the only, or even the most powerful, drivers of local perceptions of a project (for example, the impact of actual business operations on communities inevitably can be far more important); that an inclusive and respectful process of engagement is often more valuable than generous community investments made unilaterally by the company; and that all aspects of a company's operations which affect its "license to operate", from government relations to security policy, are better addressed as elements of a coherent strategy than through ad hoc fire-fighting. If managers were able to fully take these principles on board, much local opposition could no doubt be avoided. Read the full review - Rob Foulkes, Critical Resource.